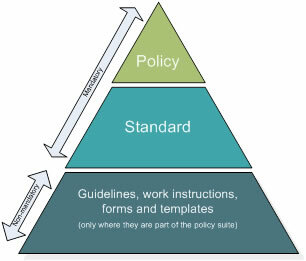 The policy framework outlines the types of policy documents (e.g. policy, standard, guideline) governing the Department of Health. promote a consistent and rigorous approach to policy development and approval, implementation. Compliance with the framework is mandatory for departmental divisions and commercialised business units. Department of Health human resource and occupational health and safety policies and standards are mandatory to both the department and specified Hospital and Health Services (HHSs). These policies and standards may be adopted or adapted for use by HHSs to support best practice and business continuity. Policy: sets out the department's intent to achieve a particular outcome. Standard: specifies the minimum actions required to comply with a policy and identifies responsibilities for staff. Guideline: provides advice on best practice and is intended to be a supporting document to a policy or standard. They cannot be stand-alone documents within the framework.